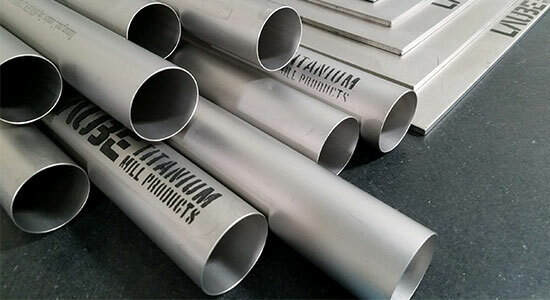 We provide seamless and welded titanium tubing in CP Grade 2 and titanium alloy Grade 9 (3AL-2.5V). The sizes range from .375″ – 2.00″ OD with wall thickness from .016″ – .109″ and lengths from 10′-20′. We also offer custom-cut sizes for special projects and easy shipping. Please use our Weight Calculator to determine the total and weight per piece of your order, based on your custom dimensions. Welded titanium tubes are used to produce process equipment such as heat exchangers, tanks, process vessels, and valves that are used in the chemical and petrochemical industries primarily for corrosion resistance. Because of its high resistance to corrosion by seawater, titanium is used in propeller shafts, rigging, heat exchangers, heater-chillers for salt water aquariums, fishing line and leader, and divers’ knives. Titanium is also used as a component in housings and ocean-deployed surveillance and monitoring devices for science and the military. Call us today (805-388-1050) to get a quick and easy quote, or fill out our contact form below.